It only took the first 6 weeks of school for me to get in a groove comfortable enough to spend a little time blogging. But I’m back and ready to blog! Earlier today, I asked my Facebook followers what you were most interested in reading about and this is the topic you chose! I’m actually really excited about it because I love lapbooks and the versatility they can bring to your lesson planning. 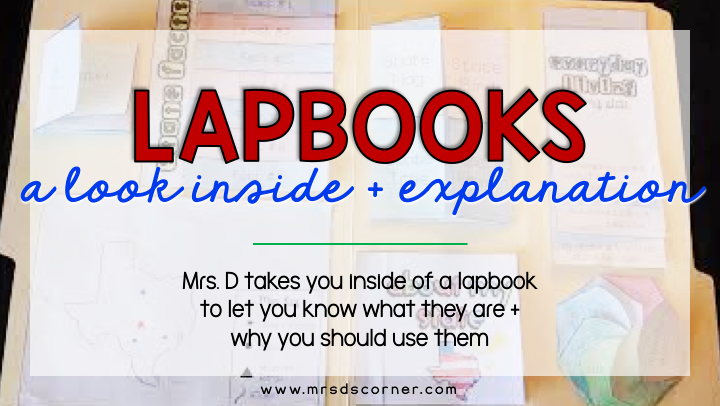 First, let’s start with a quick explanation of the differences between Interactive Notebooks and Lapbooks. Interactive Notebooks are just that, they go in your student’s notebooks. 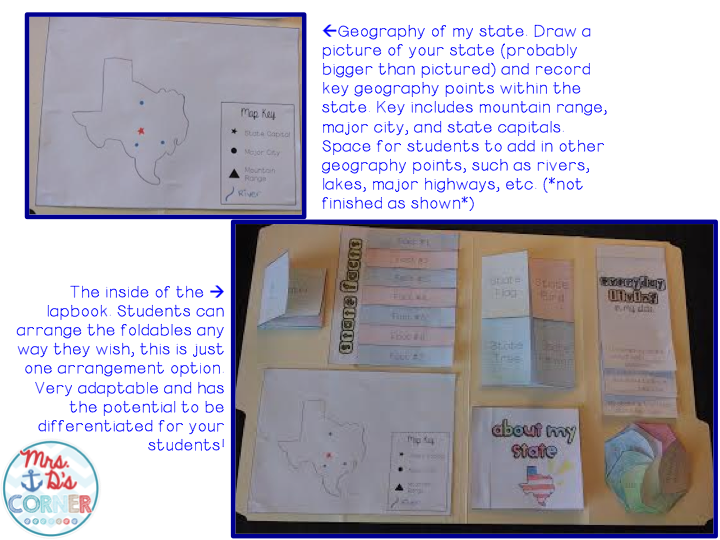 You make [or purchase] a lesson or unit, cut out the pieces and have students glue them into their academic subject notebook. As you are teaching, they fill out the pieces. Students find taking notes more interesting and are more involved than just writing down words on paper. The advantages don’t stop there. With this take on copying down key information, students are more likely to remember the information because they had fun while making their notebook. Plus, their notebooks are much more organized than words that seem jumbled together. This gives taking notes a more interactive appeal – hence the name: Interactive Notebook. Lapbooks are kind of the same deal, except different. I’m sure that makes no sense at all, so let me clear it up for you. Lapbooks are great for unit studies or specific topics. You don’t need a notebook, only a manila folder or a large piece of construction paper. I prefer to use manila folders, but I know that the cost can add up quickly depending on how many times you use lapbooks per year. You can cover the same exact information in a research project or note taking that you can with a lapbook, except a lapbook is great for having students give presentations to the class. 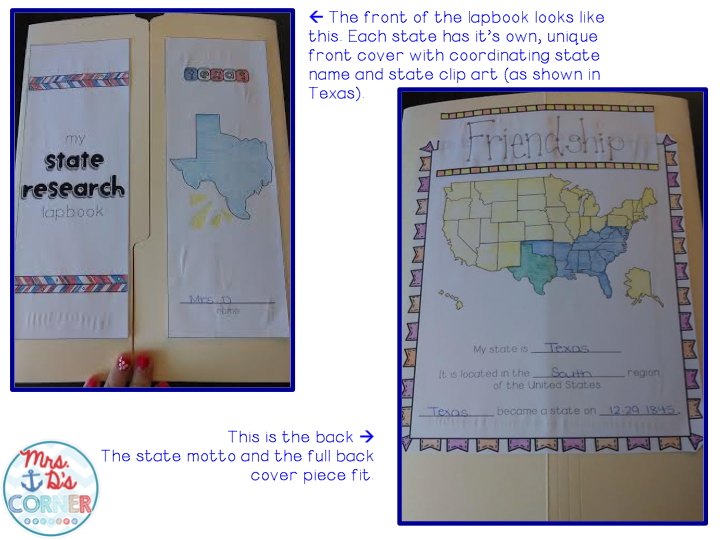 Lapbooks can, also, be used to create bulletin boards or special, holiday gifts for parents. To give you a better explanation of the difference between a “regular” unit study and a lapbook unit study, I want to show you picture examples of both. 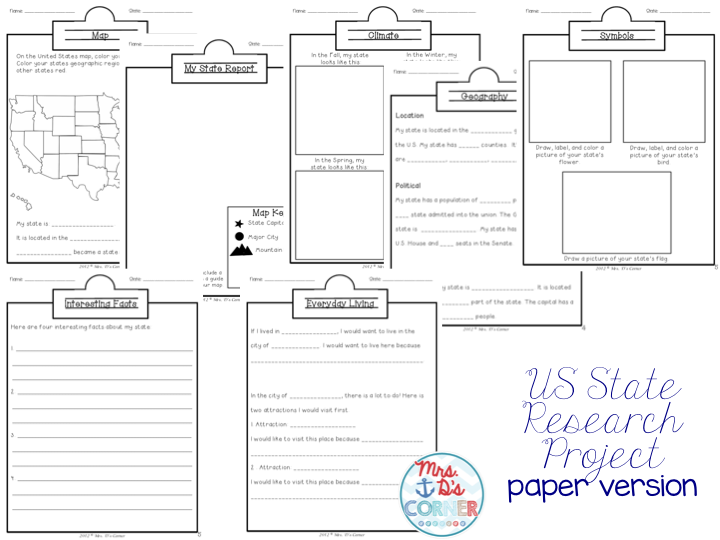 I’m going to use my States and Capitals Research Project paper version and lapbook version to show you how the same information can be displayed in the vanilla way or the exciting strawberry-banana way. The paper version is 7 pages per student in your class. The pages included are laid out in a manner that students research specific state information. The style in-which they collect information is fill in the blank and short answer. At the end of the research, they’re finished. They can give a presentation from this information, but it’s bland. It’s still a great lesson, but a little vanilla. The lapbook version is 10 pages per student in your class (so the length of copies is not much different than the paper version). Very similar to how the students collect information in the paper version, students can do the same with the lapbook before the pieces are cut out. My preference when it comes to lapbooks is giving students a day or two in the library or classroom researching the topic. Guided research. After filling out the lapbook pieces, students take home the pieces to color. I suggest cutting the pieces out in class the first couple of times, that way students know what lines to cut on and how to cut the pieces out before assigning this part as homework. By assigning the coloring and cutting as homework, you are saving valuable classroom instruction time. Putting the lapbook together can be done in many ways, but for the most part, a template is given to the students. I always make sure that I have a completely finished lapbook as a sample to show to my class. This gives them an expectation to meet, as well as a tangible guide. As you can see in the view of the inside of the lapbook, most parts are interactive (like an interactive notebook) and flap open or fold out. Just like the paper version, all of the information is there. But with a lapbook, the project seems more fun to the student. They’re still researching and learning, but they’re coloring. They’re cutting and folding. They’re making it their own – a unique piece of art. Now that you know what they are and how to use them, why should you use them? Not only do us teachers have barely enough (if ever enough) time to teach everything we are supposed to in the time frame we are given, we have loads of paperwork, meetings, professional development sessions, and lesson planning to handle. We get 28 minute lunch periods after you take away the time it takes to walk to and from the cafeteria. If we’re lucky we get a 2 minute pee break and a planning period. Now we are supposed to make learning FUN!? What does that work even mean, am I right? All jokes aside, lapbooks are educational fun. They spice up the monotonous lectures and tediousness of scripted lessons. Lapbooks are fun for the kids, too! We all know how much fun it is to sit through 7-hour professional development sessions. Sometimes the 45-minute faculty meetings seem to last forever. Imagine how it might be for our students. Even with all of our other teacher duties, learning needs to be fun for our kids! Sure, in the beginning it will take time for your kiddos to get used to researching, coloring, cutting and pasting. And yes, in the beginning it will be time consuming. But once your students get the hang of it, they can complete parts of it as homework to save you valuable classroom learning time. If you weren’t convinced that lapbooks are a great time, you can pick up one or two of over 40 different lapbooks available. Give it a try with your kids and get ready to transform your lesson plans! 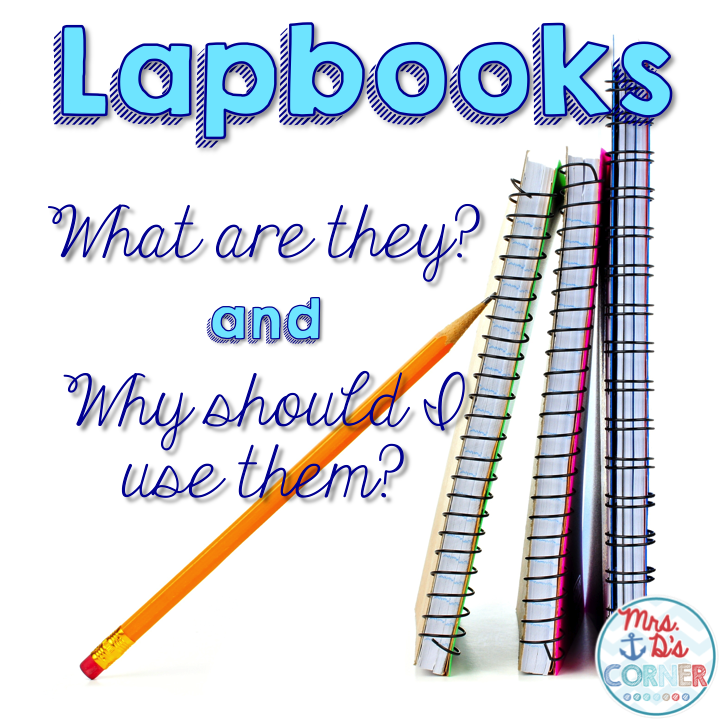 What is your favorite part about using lapbooks in the classroom? Tell us in the comments below! Thank you!! Love your lapbook! Thank you for your sharing on lapbooks. Lapbooking is truly a necessity in today's common core classrooms. Not only does it cover the content that has been aligned to the common core, it allows the students to respond to the curriculum. Writers workshop , readers workshop models lend themselves to lapbooking.